I am pleased to announce that Emergent Publishing will release Deck the Halls: festive tales of fear and cheer worldwide on December 6, 2012. My story, “Yuletide Treasure” is included in this anthology. Along the way you’ll meet troll hunters, consumer dissidents, corset-bound adventurers, a joint-­toking spirit, big-­hearted gangbangers, an outcast hybrid spaceship, petrol-toting politicians, mythical swingers and a boy who unwittingly controls the weather. Deck the Halls is the original Literary Mix Tapes. Spawned after founding editor Jodi Cleghorn sat through her first school Christmas Carols, rankled by the predominance of Christian based songs and entranced by the archaic lyrics of Deck the Halls, the anthology idea was pitched and filled via Twitter shout out. Authors nominated themselves for one of the ten lyrical prompts via Cleghorn’s website. Featuring twenty stories (based on ten lyrics), Deck the Halls was released as free web-based stories on Christmas Eve 2010, one story per hour, for 20 hours. A free downloadable eBook was made available on Christmas Day with cover artwork provided Icy Sedgwick. The idea of music inspiring short fiction found traction and Literary Mix Tapes launched as an official speculative fiction imprint in February 2011 and came under the eMergent Publishing umbrella in June 2011. Work began on a revamped and extended version of Deck the Halls after the success of Nothing But Flowers: tales of post-apocalyptic love (02/2011) and Eighty Nine (10/2011) to pay homage to the imprint’s roots. 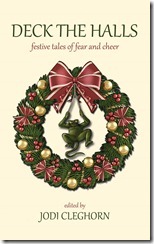 Deck the Halls: tales of festive fear and cheer features 32 stories (18 original and 14 brand new offerings) from an international line of up authors. The paperback and eBook will be released simultaneously worldwide THURSDAY 6th DECEMBER 2012. All paperback purchases will be bundled with a complimentary eBook. Pre-orders for the paperback are open now via the eMergent Publishing website. All pre-ordered paperback purchases will receive their complimentary eBook at the time of purchase. The eBook will be on sale for A$4.99 as of the 6th December. The book will be available in both formats in the usual online locations. The anthologies are a cross pollination of music and writing, and has roots in Cleghorn’s search for new ways to inspire fiction and encourage writers to work together. Built on a ‘collective submissions process’ and tapping into the crowd-sourcing potential of social networking, the anthologies are further proof of eMergent’s willingness to push the boundaries of the anthology and collaborative work to bring the freshest stories and newest authors to lovers of speculative short fiction. Authors are crowd-sourced via social media, not through an open submission process. Authors are not vetted prior to inclusion; they just have to be fast enough to secure a place when nominations open. Stories are written via a collective submissions system across a three week period, where authors work together to produce the best collection of stories, through a combination of peer support, beta reading, line editing and proof reading. Each author is guaranteed as much editorial time as necessary to produce publication ready work after submission. Every story is the best possible work of the author, rather than the best possible stories chosen from a public submission process. The authors are predominantly emerging authors and many have their first debut publication via Literary Mix Tapes. Increasing numbers of established authors are making their way into LMT’s rank specifically to enjoy and experience the community and conceptual aspects of the projects.